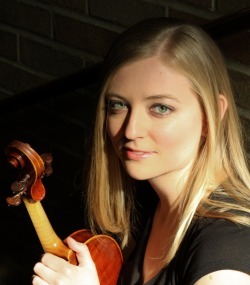 Ashley Dyer is an Ann Arbor, MI-based violinist who performs regularly as a chamber and orchestral musician. She may frequently be seen with the Toledo, Jackson (MI), Flint, Michigan Opera Theatre, and Lansing Symphonies, where she has often served as Principal 2nd Violin. Ashley also serves as Concertmaster of the pit orchestra for productions with the world-renowned University of Michigan Department of Musical Theatre. Formerly the Concertmaster of the Dearborn Symphony (MI), Ashley has also performed with the Civic Orchestra of Chicago, the National Repertory Orchestra (CO), the Lake Tahoe Music Festival Orchestra (CA), and as soloist with the Raleigh Symphony Orchestra (NC) and the Detroit Camerata. A native of Virginia Beach, VA, she has served as Assistant Concertmaster and Principal Second Violin of Symphonicity- the Symphony Orchestra of Virginia Beach. Ashley enjoys a versatile career, performing recently with such varied artists as Renee Fleming, Rachel Barton Pine, Rod Stewart, and Belle and Sebastian. In 2017 and 2018, Ashley was a Next Generation Alumni Artist for the Four Seasons Chamber Music Festival's Summer Chamber Music Institute (SCMI) at East Carolina University, where she coached young chamber ensembles and performed alongside world-class chamber musicians. Ashley performed with the Lake Tahoe Music Festival for five summers, serving as soloist and Concertmaster of the Academy Orchestra in 2015. Since 2013, she has performed as a member of the Hollywood Concert Orchestra (HCO), with whom she has toured the US and China. In 2017, Ashley performed with the HCO on a 16-city tour of Japan. Ashley completed a Masters in Violin Performance from the University of Michigan, studying with Yehonatan Berick. As a member of the University Symphony Orchestra, she performed in New York's Carnegie Hall. Ashley received a Bachelors in Violin Performance from East Carolina University under the tutelage of Ara Gregorian, where she served as Concertmaster of the East Carolina University Symphony. In addition, Ashley has studied at the University of North Carolina School for the Arts, Killington Music Festival in Vermont, and le Domaine Forget in Quebec, CA. A dedicated and enthusiastic teacher, Ashley currently maintains a private violin studio in Ann Arbor, MI. Ashley is a registered teacher with the Suzuki Association of the Americas and completed long-term training for Violin Books 1-10 with Joanne Bath in Greenville, NC. In recent years, Ashley has participated in teaching workshops with Almita Vamos and Simon Fischer. Ashley has served as a violin sectional leader, chamber music coach, and music theory teacher for Ann Arbor Huron and Pioneer High School's Summer camps at Interlochen Arts Academy. She regularly leads orchestra sectionals for schools in Washtenaw County. Additionally, Ashley has served as a chamber music coach for the Hampton Roads Chamber Players in Norfolk, VA.